Ben Jose is one of my closest friends and fishing partners. He's a die-hard dry fly angler, intrepid steelhead junkie, and generally devoted to all things concerning the long rod. When he's not casting a tight loop over seventy or eighty feet of river, he's usually casting bronze in the foundry of Benjamin Bronze Studios. In all of his pursuits, Ben's focus on excellence borders on obsession. 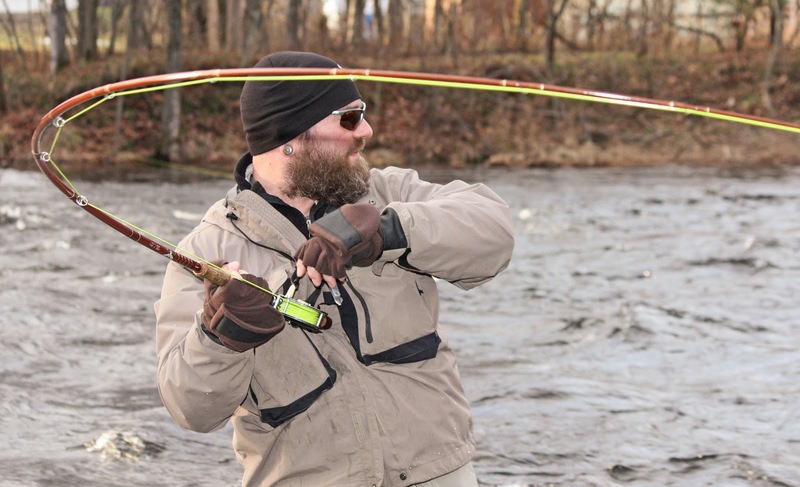 Case in point, he learned to tie simple flies and double haul just days after learning the basic overhand cast. 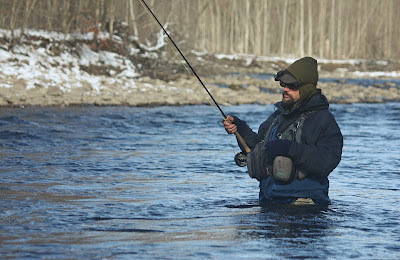 Once he experienced fly fishing, he was in full tilt. Such is the case with the art work he produces in the foundry he shares with the owner of Hudson Studios (a consortium of ridiculously talented artists and craftsmen). Ben recently branched out, allowed his passions for the long rod and metal-work to fuse, and began producing custom bronze work for the fly fisher and fly tyer. Most recently, he crafted a medallion for Pat Cohen of R U Superfly fame. 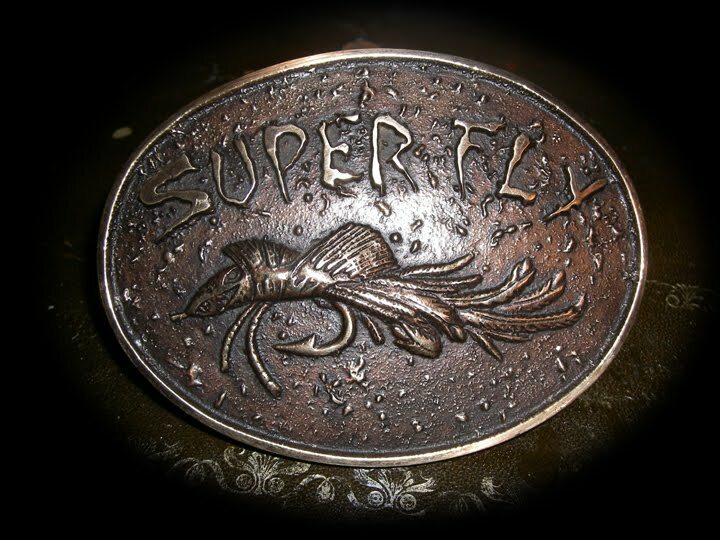 The two-dimensional logo of Pat's fly-tying business has been carefully reproduced in three dimensions of solid bronze. 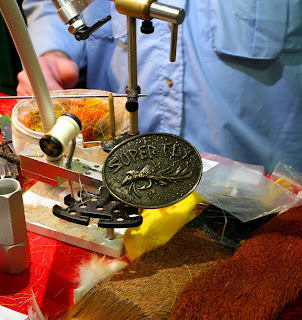 The medallion mounts to Pat's vise, and was on display during The Fly Fishing Show in Somerset, New Jersey. Anyone who frequents or follows my blog knows that I am not one to write product endorsements. In fact, Ben's bronze work is the first product I've highlighted on The Rusty Spinner. My reasons for lifting the blackout are twofold. First, Ben is a friend, and I would like to see him be successful. Second, Ben does fine work, extraordinary work actually. While a medallion would be a fine addition to anyone's vise, Ben can make nearly any idea come to life. Perhaps a base for that vise? Bronze caps for rod tubes? If you can think it, then he can make it happen. This past weekend the boys and I attended the annual Fly Fishing Show in Somerset, New Jersey. The trip was the first I've made in four years (no coincidence that my children are four years old). I'm disappointed to say that the show isn't quite the spectacle I remember it to be. Maybe it's the current state of the economy. Perhaps it's simply that the novelty has worn off all that shiny new gear. Whatever it was, I would be lying if I told you that I wasn't just a little bit disappointed. In years past, the highlight of Chuck Furimsky's gathering was for me - aside from meeting old friends and swapping lies - always the sprawling assembly of vendors that plied their wares on the floor of the Garden State Convention Center. While I cannot be absolutely certain, the show seemed to lack many of the shops that had once been in attendance, and I don't know that they've been replaced. There seemed to be more lodges and destinations represented, but there weren't many new products to see, and even fewer deals to be had. I am - after all - all about finding a deal. I remember attending a show some years ago, and buying inexpensive, one-ounce packages of bar-dyed marabou - five or six of them - before bar-dyed marabou was available through every fly tying catalog that arrives in the mail. That same year, my buddy and I picked up large bags of CDC at the booth representing Rene Harrop's shop; from Castle Arms we snagged a mature blue-eared pheasant skin that was just loaded with large feathers as opposed to the juvenile skins and small feathers available from another vendor this year. Fly Tyer Variant always set up shop just inside the doors, and sold Whiting products that were both modestly priced and available in abundance. This year Whiting was poorly represented and substantially overpriced, but I guess that's an entirely different story. Any reason I might offer for the perceived change in the show's offerings would be purely speculation. I'm sure the dwindling economy leaves many shop owners wondering if they can afford the expense of traveling and setting up shop at the show. As gas prices rise (they've almost doubled in three years), I'd guess fewer anglers are attending as well - choosing instead, to use their greenbacks to find some open water. But who knows? While it seemed there were fewer folks in attendance than there were in years past, I've really no way of knowing for sure. The bottom line is that I remember going to the show five or ten years ago, and feeling a palpable excitement as I walked through the door. It was a feeling not unlike what one might experience as he or she dons waders before a day on the water. This year I didn't feel any of the hopeful anticipation that characterized The Fly Fishing Show in years past, but before I come off as a complete curmudgeon, let me say that the show was not without its highlights. The door prizes were exceptional, even if the manner in which attendees registered for those prizes was a bit chaotic. Tyers row did not disappoint; I don't know that it ever does. Good friends Bob Mead, Pat Cohen, and Tim Blair were just three of the many talented folks in attendance. True to form, Bob did his best to talk the ears off anyone who stopped by his table. For those of you that don't know him, Bob is one of the grandfathers of realistic tying and probably the art form's best ambassador. His flies were among the first of the genre (many of his peers would say Bob's flies define the genre), and almost forty years after tying the prototype, his praying mantis is as much in demand as ever. Bob's flies have recently found homes in print advertising and television programming. His mosquito is featured in advertisements for Sarna anti-itch hand lotion, and his black widow and hornets appear in popular sitcoms such as Royal Pains. He and I made tentative plans to hit the hendrickson hatch this year. Pat Cohen may have been the busiest of the tyers in attendance. Throughout the day, he held court with any number of inspired fans. I think the appeal of Pat's tying is three-fold. First, he does exceptional work with deer hair. All of his deer hair flies are suitable for framing, and most are deadly fish stickers. Second, Pat is something of a fly tying Everyman. He doesn't work with particularly expensive or rare materials. As such, anyone can tie as Pat ties, even if they may not tie as well as Pat ties. Finally, Pat is something of an anomaly. Adorned with both tattoos and piercings, Pat stands out amongst his fellow tyers. There's an edge to his appearance, even if there isn't an edge to the man, and people seem drawn to that edge. 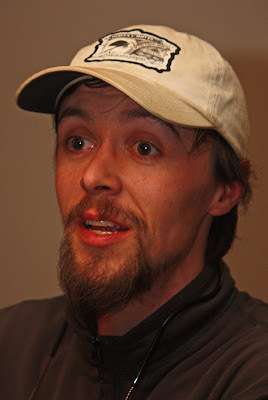 ﻿Tim Blair is one of the signature tyers for S.S. Flies, a small commercial tying operation that markets flies tied only in America to a predominantly saltwater audience. Timmy and I worked together some years ago, before either of us had children or minds to pursue anything that didn't have gills. I'm a little older than Tim, and I remember his first few rudimentary fumblings at the vise (he had a real penchant for "Gummy" material back in the day). I now have to admit that his tying skills have likely grown beyond my own. He's a talented tyer, a committed bug chucker, and a genuinely good man. S.S. Flies is fortunate to have him on board. 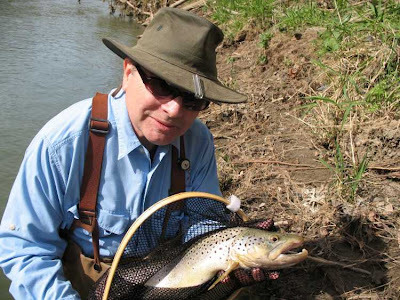 When all is said and done, I suppose it is the people and personalities that make The Fly Fishing Show a success. Most of us can do without the gear. I know I can't make the newest rods perform much better than the stick I've been fishing for ten years. It's the author that shakes your hand and signs a book, or the tyer that whips up a fly for your son and offers it up without charge, that make the three hour drive worth while. So ... I suppose I'll continue to make the occasional trip to Somerset for the show. I won't expect to be awed by the latest gizmo or blown over by the blow-out, close-outs on fly tying material. Instead, I'll make the drive knowing the show is about people who share a passion, old friends and new ones alike. Remember that scene near the end of The Karate Kid? I'm sure you know the one I mean. Danny LaRusso - the quintessential, downtrodden outcast - is squaring off against Johnny - handsome, rich kid bully and leader of the Cobra Kai. Standing in the background and off to either side of our antagonists is the always stoic, Mr. Miyagi and the frequently incensed, Sensei John Kreese. Danny is hurt, but he has held his own. In match after match, he's proven he is every bit the equal of the Cobras, and that he'll never again be pushed around. But this final fight is important. Without this last fight, Danny will never have balance with Allie. He'll never have balance with himself. Without this last fight, there will always be that tiny but constant drip of doubt. And then come the words that leave an indelible impression upon an entire generation of movie goers. In that moment, the tone of the film darkens. The audience recognizes that the battle is no longer between two teenagers, one a cruel tormentor and the other his hapless victim. In that moment, we see that the real fight is between conflicting ideologies. The first stresses power, and the imposition of that power on the weak and less fortunate. The other stresses equilibrium, the outward and inward balance of one's life with one's spirit. "Ah Danielson, you all wet." "Drive a punch Danielson ... make good fight." So, what has any of this to do with fly fishing? Absolutely nothing. This short diatribe (complete with video), just demonstrates how bad the shack-nasties can get in January. January may be the cruelest month for a bug chucker. The rivers slow, and the lakes are frozen. Tying is mere distraction. The stream of consciousness flows. Sometimes it runs to steelhead. Sometimes to trout, bass, or carp. 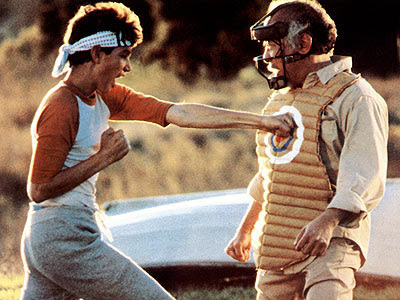 Sometimes we drift to Danny LaRusso and the silhouette of a bonzai tree on a blaze orange background. I need to go fishing.